In the early 1980’s, Randal Birkey started his freelance illustration career. At that time, one of the best ways to advertise illustration and get new work, was in the Chicago Creative Sourcebook, published in Northbrook, Illinois. Randal created this ad as his first entry into the Chicago illustration market. 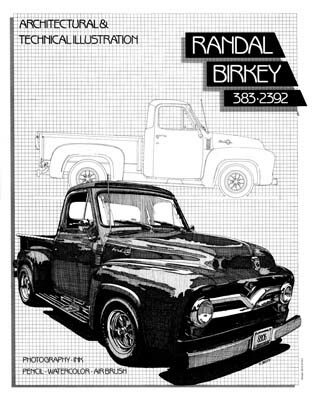 He used a pen and ink image of a 1950’s Ford Pickup truck that he himself had restored. He created a grid and a side view of the truck to use as a background.